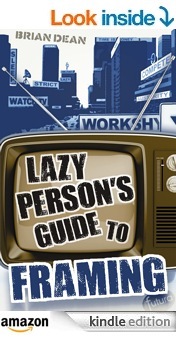 Laziness also implies wasted time according to this viewpoint. So it’s ‘bad’ in the further sense that “time is money” (see part 1). Inactivity and idleness are seen as inherently costly, a financial loss. People tend to forget that this is metaphorical – there is no literal “loss” – and the frame excludes notions of benefits (or “gains”) resulting from inaction/indolence. Regarded (by some) as removing the “incentive” to work, welfare is thus seen as promoting moral weakness (ie laziness, time-wasting, “dependency”, etc). That’s bad enough in itself (from the perspective of Strictness Morality) – but, in addition, welfare is usually funded by taxing those who work. In other words, the “moral strength” (see part 1) of holding a job isn’t being rewarded in full – it’s being taxed to reward the “undeserving weak”. But that’s a different kind of framing. In ‘Strict Father’ (ie ‘Authoritarian’) morality, one must fight evil (and never “understand” or tolerate it). This requires strength and toughness and, perhaps, extreme measures. Merciless enforcement of might is often regarded as ‘morally justified’ in this system. Moral “relativism” is viewed as immoral, since it “appeases” the forces of evil by affording them their own “truth”. There’s another sense in which “might” (or power) is seen as not only justified (eg in fighting evil) but also as implicitly good: Strictness Morality regards a “natural” hierarchy of power as moral, and in this conservative moral system, the following hierarchy is (according to Lakoff’s research) regarded as truly “natural”: “God above humans”; “humans above animals”; “men above women”; “adults above children”, etc. In this metaphorical reality-tunnel, the rich have “moral authority” over the poor. The reasoning is as follows: Success in a competitive world comes from the “moral strengths” of self-discipline and self-reliance – in working hard at developing your abilities, etc. Lack of success, in this worldview, implies not enough self-discipline, ie moral weakness. Thus, the “successful” (ie the rich) are seen as higher in the moral order – as disciplined and hard-working enough to “succeed”. Protestant ethic, in sociological theory, the value attached to hard work, thrift, and efficiency in one’s worldly calling, which, especially in the Calvinist view, were deemed signs of an individual’s election, or eternal salvation. German sociologist Max Weber, in The Protestant Ethic and the Spirit of Capitalism (1904–05), held that the Protestant ethic was an important factor in the economic success of Protestant groups in the early stages of European capitalism; because worldly success could be interpreted as a sign of eternal salvation, it was vigorously pursued. As someone whose views tend to fall into the left-libertarian category, I got attracted to this field (Cognitive Linguistics, Frame Semantics) because it provides a way to understand right-authoritarian thinking/morality (which I don’t “condone” any more than I condone drowning puppies en masse). The usual temptation – on the left – is to regard the ‘other side’ as immoral or amoral, lacking in any moral sense, driven only by greed, etc. But that’s close to viewing ‘them’ as subhuman – and before long you’re thinking in authoritarian-style, yourself. Another excellent and insightful article. We need more application of Lakoff’s framing work over here in the UK. Keep it up!